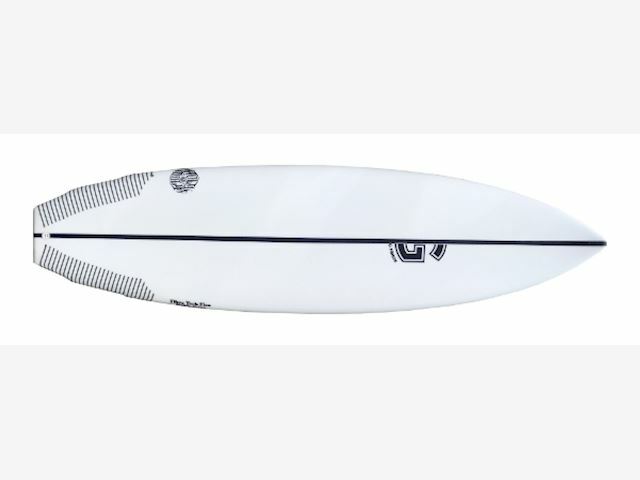 6’3 x 20 9/16 x 2 5/8 38.5L EPS Epoxy, FCS I x 3, square tail with hips (similar to the Tomahawk) To be in a situation where you have the advantages of two different things, without any disadvantages! A performance board with added volume under your chest area for better paddling and getting over those flat sections. I stuck with a relaxed outline, fuller nose and introduced a hip/break, higher up in the tail area. This blends into a straighter rail curve giving us more drive in and out of turns and putting looseness under your feet with control. The magic is the strong deep single concave that runs into a double concave and flows into a Vee behind the back fins for better release. With high performance in mind, the rocker is consistent throughout, but flatter in the bottom mid-section, so as to retain speed in flatter waves. The moderate nose entry rocker will allow for water to flow through quicker, giving a quicker onto the plane. With the added tail-lift, much the same number as my tried and tested 44 Jordy model, this allows this board to tackle any hollow wall or section on offer, accelerating in and out of turns at will and with confidence. The Holy Moly staged sectional concave reduces spillways of water, which regulates and increases lift. This converts kinetic energy and potentially puts speed under your feet instantly. A MUST TO QUIVERS! I surf this board in a 5’8 32L and it still blows my mind after each surf. I can’t actually describe how amazing it is and how it’s increased my speed, flow and power. It’s fast, fluid and very responsive. Highly recommend!!!! We live, breathe and dream anything & everything surf related. BUY DIRECT & SAVE - TOP QUALITY PRODUCTS DIRECT FROM THE IMPORTER! Check out our website page for more board models and info.